Consider us your electrical experts. Regardless of the size, regardless of the complexity, your electrical project needs to be done on time, on budget, and correctly. Intermountain will get you there. For more than 40 years, Intermountain Electric Service has been the clear choice for developing and completing a wide range of electrical projects — everything from electrical engineering to substation construction and much more. Welcome — Since 1975, Intermountain has been proud to do it all for you. When you partner with us, we’ll provide everything — design, build, start-up, commissioning, and turnkey projects. We’re committed to providing a work environment that’s safe and end results you’ll be thrilled with. Contact us today to take the first step. Welcome – Intermountain Electric Service is an ideal resource to call upon to assist in the development and completion of a vast range of electrical projects – from small basic projects all the way up to large plant and substation projects. 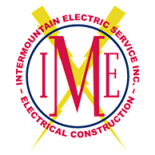 For more than 40 years, IME has been the clear choice for developing and completing a wide range of electrical projects — everything from electrical engineering to substation construction and much more. Since 1975, Intermountain has been proud to do it all for you. Our services include design, build, start-up, commissioning and turnkey projects. IME’s management is fully committed to implementing and maintaining a work environment that is safe and friendly for all. It is our goal that each and every employee go home safe and healthy at the end of the day. We’re committed to it! We're Hiring!Apply To Join Our Team Today!